1 Foot Mono 1/4 Inch Female to Right Angle Male Audio Extension Cable - Model # SA-QFSMR1, Contents: 1 Foot Mono 1/4 Inch Female to Right Angle Male Audio Extension Cable, Application: Extension Cable for Guitar Cables, interconnect and other Pro Audio Applications, Connectors: 1/4 Inch Female mono Jack on one end, Right Angle 1/4" TS Male on the other end, Features: Great for situations where you need to make a connection in a tight space, Nickel Plated connectors, Gauge: 16 Gauge, Covering: Flexible Rubber Jacket, Length: 1 Foot each, Condition: New, Weight: 0.10 lbs. each, Warranty: One year warranty. These 1/4 Inch female to Right angle 1/4 Inch extension cables are great for when space is limited and you need to connect in a tight space. This mono cable is 16 gauge and features nickel plated connectors. 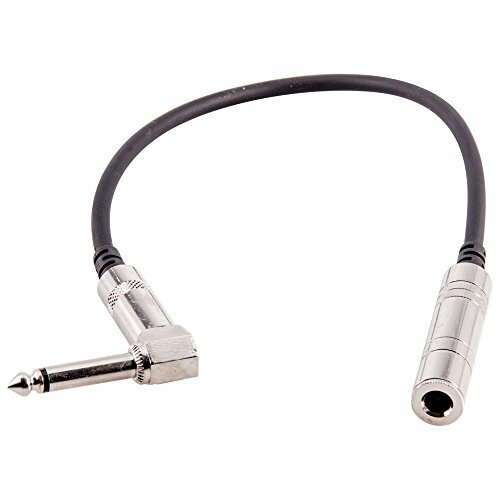 This is an ideal cable for guitar cable, interconnect and other pro audio applications. The quality of your patch cable is critical for proper sound. Seismic Audio cables are built to last and provide crystal clear sound. Put it in your cart today and be prepared for years of trouble free and high quality sound.